Pairs of MEPs and scientists learn more about one another’s working life, with scientists shadowing MEPs as they go about their parliamentary business, attending committee meetings and meeting officials working in key policy areas. The MEPs will later spend time with the scientists at their research institutions. Held for the first time in 2007, the MEP-scientist pairing scheme was set up as a multidisciplinary job-share between MEPs and scientists in a world where scientific knowledge is of increasing importance to policy making. The scheme is also designed to develop longer-term relationships between the legislators and scientists to enable further development of the particular research areas under the spotlight of the scheme. The exchange gives an intriguing glimpse of cutting edge research deemed to be of significance to EU future skills. Of the 12 scientists in the scheme, there is a strong show of environmental expertise, but also the most senior crisis management expert in the EU and a robotics pioneer. 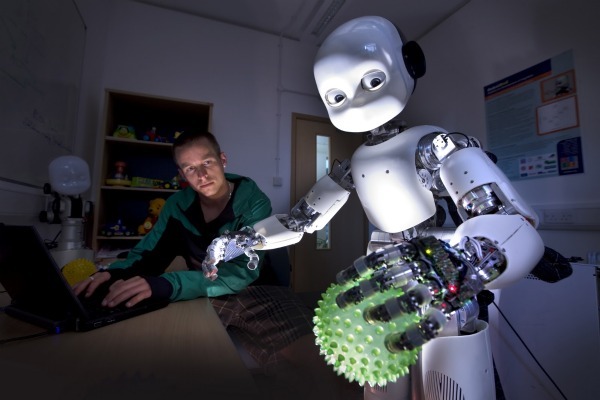 Artificial intelligence professor Angelo Cangelos – who is partnering with Greek MEP Ioannis Tsoukalas (European People's Party) – conducts research on teaching robots how to learn the names of objects, and to adapt to the environment around them. His research attempts to reproduce human learning facilities in robots, so that they learn spatial awareness. He told an explanatory meeting at the Parliament this week that it was hoped that such robotics research – which is partly EU funded – could eventually develop robots to care for the elderly and hospitalised children. Meanwhile one of the EU’s most senior crisis management experts – Delilah Al Khudhairy, the head of the global security and crisis unit at the Commission’s Joint Research Centre – is partnering UK Conservative Giles Chichester. Al Khudhairy specialises in finding the unpredictable impacts of crises such as the Arab Spring, the e-coli outbreak in Europe earlier this year, and the economic malaise. Crisis control and the environment are well represented among the job-sharing scientists. Ida Westerberg, who is partnering British MEP Fiona Hall (Liberals and Democrats), is an expert on observational data modelling. During her explanatory session in the Parliament she warned about the the lack of global water data. She said the availability of quality data on hydrology has been declining since the 1970s, at a time when such information is needed to determine the impact of water shortages. Natural disasters such as hurricanes were partly responsible for destroying meteorological stations around the world, she said, and these are not replaced. But Westerberg added that countries are not reporting data on water in the same way that they used to do, and this is hindering detailed analysis. “It is treated by governments increasingly like state secrets, because of the political issues affecting water,” she said. The two first MEP job-sharing schemes were organised by the Commission’s DG-Research in 2007 and 2008. After the second scheme the Commission handed over to the Parliament’s Science and Technology Options Assessment unit which launched the third MEP-scientist pairing scheme this week. STOA is the independent body in charge of providing expert assessments of the various scientific or technological options to the European Parliament’s Committees active in many and varied policy sectors. The scheme aims to support the development of relationships between MEPs and scientists to improve access to scientific advice and deepen scientists’ understanding of the role of science in policy-making. Scientists will shadow their MEPs during 21-24 November 2011 in Brussels. 21-25 Nov.: Scientists in the European Parliament.